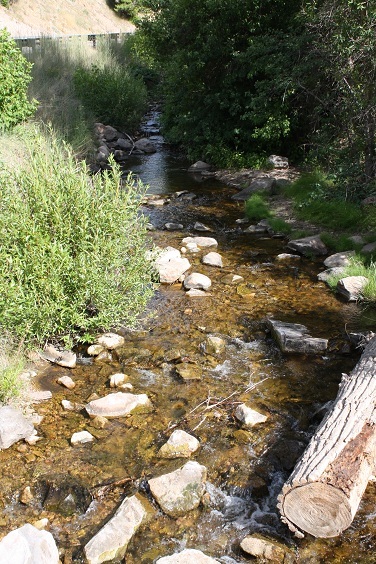 Daniel's Creek is a very small stream that runs from the top of Daniel's Canyon (Hwy 40 South of Heber) down into Heber. It is occasionally stocked by the DWR with catchable sized Rainbow Trout. The nice thing about this little creek is that is has easy access. Along nearly the entire canyon you can pull off and try fishing the little stream, although it doesn't support a large trout population due to its small size and potential for overfishing. From Heber head south on Hwy 40 up into Daniel's Canyon. Park at any of the pullout areas, such as Center Creek. Try tiny worms (not nightcrawlers) tossed into the holes and under bushes or near undercut banks. Especially in late summer, a small live grasshopper can produce. These fish spook easy in the clear water of this small stream, so stay low, wear darker colors that blend with the trees, and approach holes from downstream.